What’s it Like to Play Against Novak Djokovic? By Jeff Greenwald, M.A., MFT. What is the first question players are asked after a match? “How did you do?” Most players, shaped by the standards set in our society, naturally respond, “I won” or “I lost.” Usually, this is the end of the conversation. Unfortunately, the communicated message is that winning is what counts. By Jeff Greenwald, M.A., MFT. Many recreational and competitive tennis players talk about the “zone” – that magical day when the ball appears larger than usual, the court wider, and confidence is overflowing. This experience eludes most players and is typically discarded because of its elusive nature. It comes and goes, and rarely stays long. Research shows that the better you become the less you tend to focus on the end result. Instead focus on performance, the process of HOW to achieve that outcome. By Jeff Greenwald, M.A., MFT. 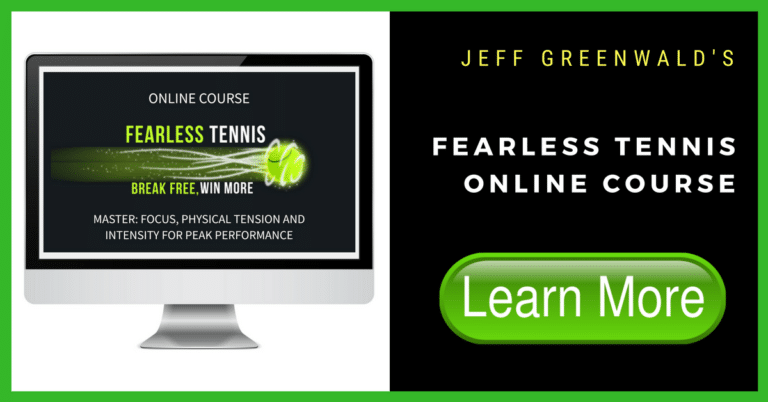 A great deal has been written about the mental game of tennis; yet despite all the books, articles, and videos, players still come on the court and play scared. Why? What’s going on? Why do so many players do incredibly well in practice and then play differently, tentatively in matches? Is Anger Always a Bad Thing? Have you ever wondered why you can perform a little better when you’re angry? You know, your opponent calls the ball out because he really wants it to be out. But, you know it was on the line. Certainly, many players can come unraveled and stew over the injustice. Those of you who have listened to my CD program, Fearless Tennis, or have read my book, The Best Tennis of Your Life, know that I am passionate about pushing the envelope when it comes to playing “loose.” Okay, fine. Maybe a bit obsessed. But this newsletter is not only about how to get loose. Any Spirit in your Game?